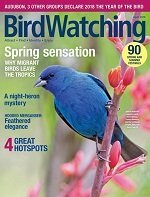 Creating a backyard bird habitat is something most of us can do in our yards that will provide many hours of birdwatching enjoyment. By including the whole family you are able to pass along the importance of providing for wildlife to the next generation. Technology, as we all know, dominates most of our lives. Computers are wonderful, but no amount of gigabytes can duplicate the sight of a male Cardinal offering a seed tidbit to his mate. No television program can be more real than a wren building her nest. And no website can capture the nuanced sights and sounds of your backyard habitat oasis. It's important for us to stay in touch with the basics, to be aware of the natural world around us. What could be more basic than enjoying the backyard scene from your deck chair? There's the hedgerow planted for food and shelter against a backdrop of fir trees filled with nest boxes. Nearby, berry bushes and seed-producing flowers highlight a water garden. As the birds fly from one attraction to another, we have the privilege of sharing nature -- up close -- with our family and friends. But this entertainment is available only if people are willing to do their part. Imagine returning to a favorite summer vacation spot only to find it had been turned into a subdivision, or worse, a parking lot? Well, it happens to birds all the time. Every time natural habitat is paved over or subdivided, some bird loses its home. Are we long past Joni Mitchell's lament? We can't reverse the destruction: they've already paved over paradise. But we can turn the trend toward bird-friendly habitat. We just have to do it one backyard habitat at a time. A well-landscaped yard of any size contributes to the overall "greening" of America. The backyard habitat consist of three basic elements: food, water and shelter (including cover and nesting areas). You don't have to create a new landscape all at once. Nature takes its time and so should you. Start by drawing an overhead picture of your current yard. Then imagine how you want the end result to look and what features you'd like to add for the birds. Incorporate existing elements in new ways. Make the rock garden an extension of a native plant garden. Add bushes to the yard edge that will provide bird shelter and hide the old fence. Fit a bird bath in front of the apple tree. Placement of new trees and shrubs in your backyard habitat is a good beginning since they will take the longest to become established. Native plants will provide cover for birds near your feeding station. Because they are well adapted to your area, they are hardy and disease-resistant. Contact your local conservation district or farm bureau extension office for help in selecting what plants will work best in your climate and soil conditions. Once the plants have been chosen, the next important element is water for drinking and bathing. 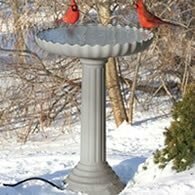 In order to keep feathers clean, birds depend on a reliable water source year 'round. The most natural spot for a bath is on the ground, but higher placement reduces attacks by cats or other predators. Choose a location near trees or shrubs for further protection as well as a place to preen after bathing. Adding a dripper or small fountain creates the irresistible sound of moving water. Whether still or moving, always keep water sources scrupulously clean. To get feeding birds, you must have breeding birds in your backyard habitat. Nestboxes can be purchased or easily built out of wood scraps. The key is to install the right one for the species you want to attract. In general, nestbox guidelines include good building materials (wood is ideal), dimensions that accommodate specific birds, adequate drainage, ventilation, ease-of-cleaning and protection from the weather and predators. Put nestboxes in trees or along field edges to attract cavity-nesting birds such as bluebirds, chickadees, nuthatches and swallows. To accommodate non-cavity nesters, such as robins, put a nesting shelf under the eaves of the house or garage. 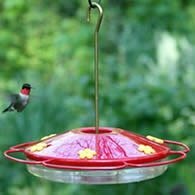 As you convert your backyard to a more bird-friendly habitat, food already has been incorporated with the use of seed and berry-producing plants. 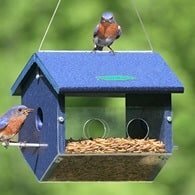 By adding feeders you expand the birds' selection and give yourself a perfect spot to observe the birds in action. 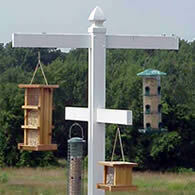 Start with a hanging feeder for sunflower seed, a hopper feeder for a quality seed mix and a suet feeder. As more birds arrive, add or adjust the menu. This is a fun, exciting learning process that ensures hours of enjoyment. It is individuals just like you, working to restore ecological health to their own private land, who are taking the first step toward protecting habitat. You contribute to the rolling quilt of backyard habitat oases across America, helping preserve its natural diversity. Subscribe To Our YouTube Channel To See All Our Bird Videos! All Content Copyright © Wild-Bird-Watching. All rights reserved.